One of the most spectacular events for a few weeks during the spring in Del Norte County is the liftoff of the Aleutian geese from Castle Island. They leave the island at dawn to feed in the fields surrounding Lake Earl. When the Aleutian Goose Festival rolled around one year I decided a little late that I should draw a goose picture. With a few quick alterations I was able to revise my Castle Island drawing in time for the festivities. 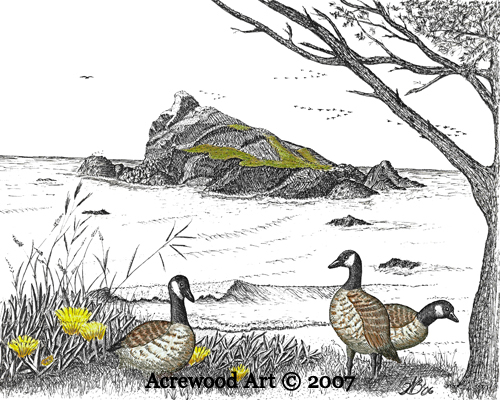 The Aleutian Goose Festival is held each spring in Crescent City, California.